There sky is so intense right now, I’ve been finding it difficult to even process what is happening and really understanding what this Lunar Eclipse, Full Moon in Leo was all about. For myself, I realized I needed to break it down into smaller parts, as a lot of the reports I was reading were feeling overwhelming. I almost wasn’t going to put out a ritual, as I felt overwhelmed by it all. So I tried to simplify it all, and find what resonated with me. I am not an astrologer, and so it is my take on what I understand and what I am feeling. What technically is a Supermoon, Blood Moon and Lunar Eclipse and what are the effects? “Lunar eclipses can occur only during a full moon, and this one is extra special because it's also a supermoon. A supermoon occurs when the moon is full and closest to Earth in orbit. The moon will be in perfect alignment with the sun and Earth, with the moon on the opposite side of the Earth from the sun. Why does it matter that Moon is in Leo, and the Sun is entering Aquarius? Leo, is a sign often associated with creativity, courage, and passion. It is also a sign that wants to fit in and often thinks of themselves and looses sight of the larger collective. Aquarius is a sign associated with being progressive, original, independent and inventive. Very connected to bigger picture and the outside world, wanting everyone to rise. How are we effected by this Full Moon being so connected to Uranus? Uranus is the planet of change and transformation. It can be quick and unexpected changes and opportunities. Ok, so what does all of this mean? As I have writen before the Full Moon, ( This one being even more intense due to all of the above), brings light on the things we sometimes don’t see, often the things we are trying to keep hidden. Many refer to this as our shadow. While this can be incredibly emotional, it is also a time of great release. When we don’t pay attention to our shadow and don’t become friends with it, it actually becomes more powerful in blocking us from the things we truly want. 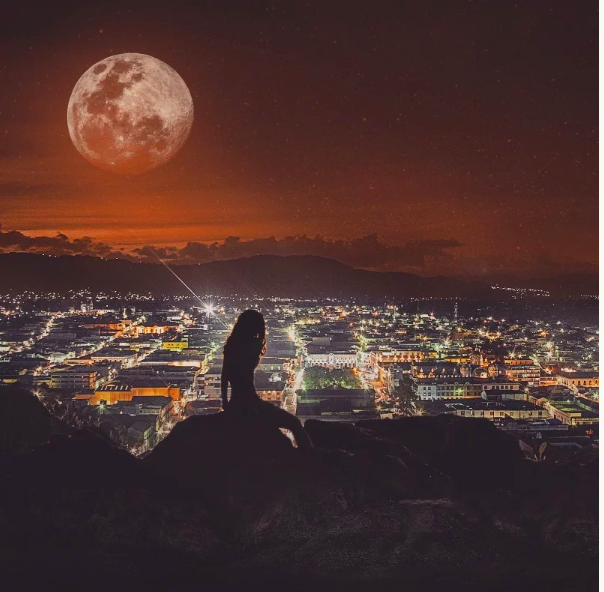 The Full Moon is a beautiful time to get quiet, to get honest with yourself…Allow the light to show you the things you have been trying to hide from. From there, you can learn to integrate them and therefore loosen their powerful hold over you. It is a time to look at what we are doing for ourselves? What are we doing for others? What are our dreams? How are we showing up for ourelves? How are we showing up for others? And as the light shines, what are your beliefs that are holding you back? Where are you not taking action to go after what you want for yourself? Where are you focusing on yourself too much and not thinking of others? How can you show up better for yourself and others? I made the following Meditation + Journaling prompts to help you take advantage of all the energies in the sky. Go some place quiet and private. Maybe light a candle, incense and dim the lights. Have a journal and a pen near by. When you are finished, pull out your journal and acknowledge the things that came up for you. You might want to reread the questions above. Writing out what you are ready to release, each thing that came up. Take your time, feeling and releasing what you are tired of carrying around with you. Get honest. Allow the energy of Uranus to change things up. Release whatever it is that is holding you back. As I always say, I am not an astrologist, but I deeply feel the energy of the moon cycles. While my meditation is a daily practice, I feel during the days leading up to, during and a little after the Full Moon I tend to get even quieter. Really allowing myself to feel and honor what is coming up for me. As I have said before, the Full Moons, regardless of what sign they are in, have a focus on releasing and endings. They also bring light on the things that we have not been wanting to look at. These are the things that we might not want to acknowledge or accept about ourselves, some refer to this as the shadow. While it can be uncomfortable and painful, we need to allow our dark side to show itself to us. When we allow it to be seen and felt, we can release ourselves from the power and shame it might hold over us. The past few weeks, even more so this past week, I have found myself more withdrawn, needing more alone time than I have before. And, to be honest, this summer has been a bit more heady than I had expected. I find myself questioning even more than I have in the past. As I go inward to understand myself, I seem to be filling myself with more questions. While I receive the things I have wanted for so long, I notice that my inner voice of self doubt has been mumbling louder than it has in the past. Most people who meet me would say, wow you are so confident, and there is a huge part of me that agrees with that. I am aware of the things I know, the good I do, and my abilities and feel confident in them. But, as everyone knows, our mind can have conflicting thoughts. I can feel the confidence and then within moments, I can spin into moments of self doubt. I can get caught up in comparison and self judgement. How do we accept the parts of ourselves that we don't love? How can we work on them, while still honoring them? My parents have told me that I was born "different" and always questioning. I will never forget the call I had with my father to let him know I was changing my major in college from business to philosophy, He was silent and then outraged. What was I going to do, stand on a corner and constantly question life? While I have had many different versions of myself, it seems I always go back to wanting to understand it all more. My dedicated meditation practice has helped me really understand myself more. It allows those questions to be more of a curiosity then a downward spiral into darkness and depression. I am so deeply grateful to my practice, and the effect it has on my anxiety and depression. Its' ability to help me move through my bouts of depression has been life changing. Now, I can honor those moments and still turn them around with much less time and pain then I have before. I have been practicing the meditation below, and it has been really helpful to quiet my mind. When I pay attention to my breath, it reminds me I am alive. As it moves through me, I can feel it nurturing and cleansing my body and my mind. Connecting with it, knowing it is my life force and that it has so many answers in it. It puts me in a state of compassion not only for others, but for myself as well. It also helps to put me in action. When I acknowledge where I am feeling challenged, this meditation has been helpful in receiving clear action steps to move me out of the place of self doubt. Steps that feel in flow and not in force. I have made the recording below, and have been listening to it daily , so that I could be reminded of the power of my breath. 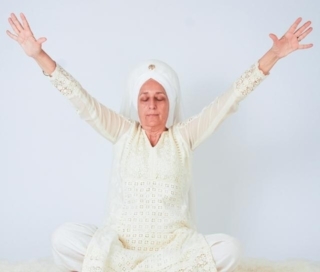 As you listen, you will hear me read from a moving lecture from Yogi Bhajan and his eloquent words on the breath of life. When you are finished, pull out your journal and acknowledge the things that came up for you. What are the whispers that you have been trying to ignore? What would happen if you acknowledged them? Are there things that you could do that could lessen their power? This praanayam creates this balance and allows the mind to rid itself of doubts. The radiance and beauty of a person depends on the clarity and shine of his circumvent force field, which in turn depends on the balance of energy in the left (moon) and right (sun) sides of the body. Posture: Sit in Easy Pose with an erect spine. 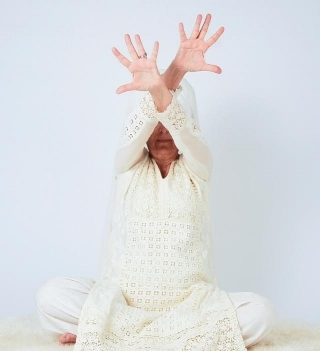 Arms are straight with hands on the knees in Gyan Mudra. Eyes: The eyes are open gazing straight forward. Breath: Inhale for 5 seconds. Suspend the breath for 10 seconds and then exhale for 5 seconds. Begin with this rhythm and gradually increase the breathing time to inhaling 10 seconds, holding 15 seconds, and exhaling 10 seconds. Meditate on the inflow and outflow of breath. It is the divine spark of life. Time: Continue for 10 – 15 minutes. "Eclipses are magical moments where something slips through an energy portal to both destroy and create. It’s a path opener. Eclipses are known to bring things to a head; something is released, especially at a total lunar eclipse. It’s time to bring things sleeping into the light. "There are many energetic interactions here, but the big message is SLOW DOWN. We are being given a unique opportunity to shift our vibration. The catch is that the cosmos insists, through these retrogrades, that we downshift, sit still and be 100 percent present with the energy. Don't you feel a little better already? No need for the doomsday fear...So, with that in mind, let's focus on the things that we are ready to let die so that something can be reborn. This is not just a limiting belief, but maybe something or someone that you have allowed to remain in your life that you know isn't allowing you the space to let in what you truly desire...You need to get really honest with yourself. Get quiet. Go in and acknowledge what you need to end in order for something else to begin. Pay attention. Practice this for the next few days, taping into your intuition so that you can truly know what it is you want and what it is your doing because of fear or to fit in. Because we are dealing with a lunar eclipse, we want to tap into our lunar side. The side that is ruled by intuition, that is calming, creative. We will use the same meditation we did for the last Full Moon, as it is Left Nostril breathing, which stimulates your parasympathetic body, as well as your intuition. I will be doing this breath for the rest of the week. Allowing my intuition to get louder. The moon in Aquarius is also a time for community, and collective consciousness. Where are the places in your life where you can help others and not just yourself. Focus on making changes that could help the world around you. I suggest you gather with some friends and do the below meditation together, or find a group event that you can attend. The energy of the Full Moon, especially this one, is amplified with group meditation and vibration. There is also a journaling exercise in the recording. If you finish journaling and feel called you can chant along and do the mudras for the Antar Naad Mudra for the Full Moon . Watch the 3 minute video. It will show you how to TUNE IN and the mudra. This is a meditation you only foo on the Full Moon. When you are finished, pull out your journal and acknowledge the things that came up for you. Writing out and saying out loud that you are ready to release each thing that came up. Take your time, feeling and releasing what you are tired of carrying around with you. Acknowledging what you truly want, and not what you think others want. Get clear. Now you will ask me if a mind can be controlled. Yes. Not only can your mind be controlled, your life can be controlled. A situation can be controlled. Sometimes you get into very, very, very ugly situations. If you have the practice to switch your breath to the left nostril, you will get out of it in two seconds. The moment you start breathing with your left nostril, your elementary self will come into play. The moment your elementary self comes into play, your totality of the mind becomes one unit to confirm and it puts out the radiance shield of your body and you will immediately become very pleasant and positive rather than angry and reactive. Some people train themselves to breathe through any nostril they choose. But many of you have not practiced that, and therefore you use your hand to close your right nostril. Long, deep breathing through the left nostril is good for the heart and good for the health. It will calm you down. Normally after you have done this exercise for two minutes you will start feeling bored. Negative mind is in action: 'What are you doing this for? This is a babyish thing. We could have done something better.' In any exercise which touches the mind, a person starts getting upset in exactly two and half minutes. That's the rule of thumb. The mind doesn't want to be caught. It wants to swing. But there are some people like us who feel that it's hard work to control the mind, and once we control the mind, then we can control the whole world. The Full Moon in Capricorn is about tuning into yourself. Checking in on what is your internal world versus the outside world. In what ways are you not standing up for who you are in order to please other people? It is important to get really quiet so that you can hear what the real YOU wants and needs. It is about getting clear. This Full Moon in Capricorn also marks the end of the first part of the year. It is a time to look back to what intentions you set for yourself at the beginning of the year. Are you doing the work? Are you being honest with yourself? Are you being true to YOU? However this full moon manifests in your life, take heart and don’t give up hope. This isn’t an unsatisfactory end, but a staging post on a longer and altogether more significant journey. There is much wisdom available in the light of this Moon. Those who are willing to look with eyes wide open will see with greater clarity where they’ve sought to side-step responsibility in favour of an easier road or more naive approach to matters of gravity. Tonight we will do a Kundalini Meditation for Dealing with Your Own Mind. The instructions are below + I have recorded an Audio File for you to follow along with as well. There is also a journaling exercise in the recording. If you finish journaling and feel called you can chant along and do the mudras for the Antar Naad Mudra for the Full Moon . Follow THIS LINK and watch the 3 minute video to see the mudra.. The breathe is one of the most powerful tools for regulating how we feel and how we think. We are the only living creatures that have the ability to self regulate it. We can use the breath the calm us down, as well as invigorate our energy. The three-part breath is one of the easiest ways to create a state of calm. Using this breath for meditation will quickly ease your mind, eliminate fear, and help you sink deeper into your body and into the present moment. Use this tool anytime you experience anxiety or depression. You can use THIS AUDIO FILE, where I explain it and count you down. Once you have heard me counting you down a few times, some of you might just want the music, without me speaking. ACCESS THE PLAYLIST HERE This will not have me speaking. Lie on your back or sit in a comfortable seated position, eyes closed, with one hand on your belly and the other on your heart chakra. If that doesn't feel comfortable, find a way that does, maybe hands on the knees, or sitting on your knees; whatever feels comfortable for you. With your eyes gently closed, look up towards your third eye. Pay attention to the breath in the body, the sound of the gong playing, and what you see behind your closed lids. As the gong sounds, you will start to breath in through the nose and out through the mouth. After a few rounds, move into the three-part breath sequence (explained below). The three-part breath is a one-minute cycle. 20 seconds to inhale, 20 seconds to hold, 20 seconds to exhale. Most people can not do the 20 second count. We will work with a count a 5. The important part is that each part is equal, 3-3-3, 5-5-5, 10-10-10 etc...Go at a number that feels good to you. Be gentle with yourself. Be calm with the breath. Don’t force it.